Hubble Space Telescope image of the galaxy cluster Abell 370. Step aside, Star-Lord – there's another superhero in the universe, and it's "guarding" far more galaxies than you can even fathom. In honor of the release of "Guardians of the Galaxy Vol. 2" in movie theaters today (May 5), scientists with the Hubble Space Telescope have released gorgeous new images of all the galaxies in our universe. The abundance of galaxies in Hubble's view illustrates that, in the grand scheme of things, the fictional Marvel galaxy is pretty insignificant. 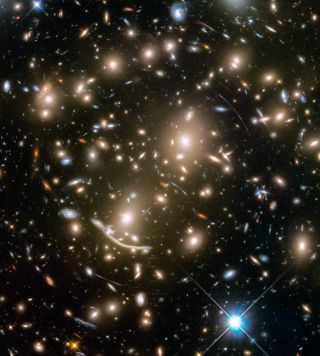 These images from the Hubble Space Telescope's Frontier Fields program features massive galaxy clusters that act as gravitational lenses in space, magnifying and stretching images of distant objects in the background that would otherwise be too small and faint for Hubble to see. "If it wasn't for this dark matter – this extra mass that holds [galaxies] together – they would all fly apart. And so you could call dark matter really the guardian of the galaxies," Coe said. Of course, dark matter won't be able to battle any supervillains with diabolical plans to take over the galaxies Hubble has spotted, but, thankfully, scientists have found no evidence that Thanos, Ronan or any other evil characters could possibly exist in our universe.